The Avon Ring is a wonderfully varied circuit, offering a mixture of canal and river cruising. Journey south from Brewood via the Birmingham Canal Network main line and Gas Street Basin until the junction at Kings Norton with the Worcester and Birmingham. The Stratford Canal has its own special flavour with characteristically lush vegetation and the split cantilever bridges and barrel roofed cottages unique to this waterway. World famous for its theatres and Shakespearean heritage, Stratford is a mecca for visitors and, with the abundance of quality shops and restaurants, a memorable visit is assured. Rising near the old battleground at Naseby, the Avon becomes navigable at Stratford and meanders along a beguiling course westwards via the fruit-filled Vale of Evesham and on to the junction with the Severn at Tewkesbury. This outstanding example of an English country town is well worth exploring, with its fascinating Abbey and many narrow lanes of half-timbered buildings. 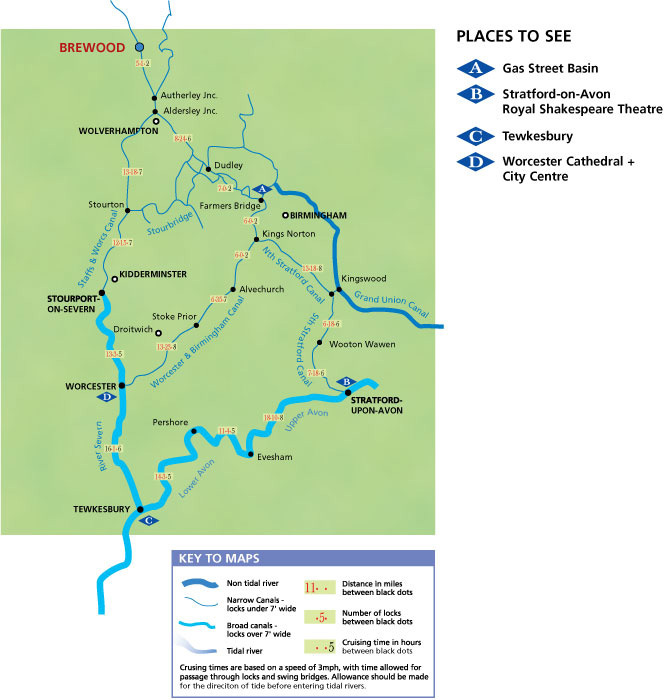 The deep, wide waters and willow-lined banks of the Severn offer a marked contrast to the more sedentary Avon and glimpses of the Malvern Hills and occasional sandstone outcrops enliven the journey up-river to Worcester, and beyond to Stourport. Follow the Staffs and Worcester and Shropshire Union Canals back to Brewood to complete a memorable fortnight capturing the very essence of England.